I have wanted bees for decades, never realizing the cost and time to assemble the equipment. Not sure if I will ever break even but what the hell, game on! Here is my diary hoping for gallons of local honey per year. Got my bees on 19Apr2017 from Kathy again. The nuc was physically heavier than my previous purchase. Followed her advice and immediately placed a second deep brood on the first. 2Jul2017 - checked upper box, bees on 100% of the frames, with the inner 8 heavy with honey. Killed maybe 10 black hive beetles in the top brood, didnt see any evidence of moths. Placed queen extruder, medium box, new drink additive, ventilation board, and outer cover, in that order, on the hive. Keeping my fingers crossed. Nothing noteworthy. My bees either left or died within a few months. Attended my 6-week basic beekeeping class at the Tallapooa Extention office in Feb and March 2015. Got my 3 pounds of bees April 1, 2015 (not sure if I want to question the weight because the bees in their little screened box looked mean and pissed-off. Locked them up in their new home with a couple gallons of 1:1 sugar water drink. Partially opened their entrance way on Tuesday, April 7, to let the little critters fly about to pollinate my blue berry and black berry plants and assorted fruit trees - offering them more of the sugar drink. Donned my beekeeping protective clothing for the first time. That material must surely prevent any stings as it is thick and will be warm to wear during the nice part of the year. Queen is out of her cage and mingling among the 3 pounds of bees! Tuesday, 14Apr2015, played and learn to use the smoker. Got all suited up with smoker, beehive tool and sugar drink and headed to the hive. Opened to expose the frames. Interesting, the bees were building comb above the frames and into the center of the drinker. Later, tasted the comb - tasteless but cool in its structure and purpose. My first thought was "wow" when I picked up the center frames feeling their increased weight over the ones away from the center. Suspect I found the queen but not confident. Looking at the work the bees have accomplished was amazing and captivating. Gave them another shot of sugar drink and re-assembled the hive. Tuesday, 28Apr2015. I am most thankful for Kathy of Eclectic Bee Farm (linked below) who has been patiently addressing my questions and concerns. 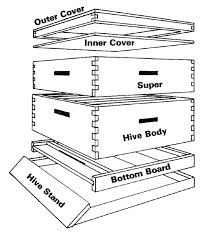 Following my question and her answer today I grabbed the smoker, large super, more sugar water, and protective gear and went to my hive. Upon removing the drinker I disrupted comb with delevoping bees on top of the frames. Also saw a couple of black hive beetles already. Inspected each frame and decided the hive was ready for the additional super. While protected I found it interesting and relaxing watching the bees. Added the gallon of sugar water, put the covers back on and headed home. Tallapoosa River Beekeepers Association, Tallapoosa County Extension Office 125 N. Broadnax Street, Room 23, Dadeville, generally 3rd Thursday of the month with expections being November and December and outing to a bee yard. Avasflowers.net has some information you will find helpful with your bees. Keith Robinson - a very helpful and knowledgeable. An excellent one to ask questions of. Pretty much everything one can imagin about beekeeping. Link provided by Susan Kitchen's son, Jack. AU Seed Library - is hosting "a community exchange for annual, perennial, vegetbale and herb seeds." The library is on the first floor of Ralph B. Draughon Library. More information on the library may be found by contacting Patricia Hartman of the AU Library. I suggested to Patricia and Jayme Oates of www.farmscapesolutions.com catagorizing the seeds in the future by purpose, such as "bees like 'em," for us bee keepers. With good forage in late autumn/winter and supplemental feedings the colonies will survive the most disasterous month, March.